Makita’s 18V LXT Barrel Grip Jig Saw is the choice for Pros that want more precision in their work. The barrel grip design and solid ergonomics give you more control than a D-handle with superb ergonomics. It features 3 orbital action modes(plus straight cutting), a cutline blower, 45° beveling, and a variable speed dial to cover what Pros look for on a jig saw. The system is powered by a Makita-built brushless motor that extends runtime and reduces maintenance. Whether you’re already using Makita’s 18V LXT system or not, this is an excellent addition or entry into their woodworking tools. This is a fantastic jig saw for the woodworker or carpenter looking to move up to a premium tool. Bosch’s IDH182 combines the 1/4″ hex drive of an impact driver with the 1/2″ square drive of an impact wrench for the perfect combination of fastening tools. With 1600 inch-pounds of torque, you’ll be able to tackle most any fastener the job site throws at you without having to look for a socket adapter on those hex heads. Paired with a Core18V battery, you’ll get a bump in performance and make your next job a little more Freaky. Nearly every tradesman will appreciate having the combination of 1/4″ hex and 1/2″ socket fastening on one cordless tool! Makita’s XSH06PT is their newest cordless sidewinder style circular saw. It’s a brushless X2 model that brings outstanding performance to ride alongside their Rear-Handle model. Paired with the new Max Efficiency blade, the XSH06 blends power and ergonomics to make for an outstanding cutting experience. If you’ve been waiting for a high-performance cordless sidewinder, this is the one. This is a Pro-level cordless circular saw that will give you the ability to cut the cord for good. When you’re ready for a chainsaw designed by Pros at a price property owners can reach, check out the Husqvarna 450 Chainsaw. The 50.2 cm³ engine delivers up to 3.2 horsepower to drive the 20″ bar and chain. Husqvarna’s X-Torque engine design combines better fuel efficiency with fewer emissions so you can even use it in the great state of California. Easy starting and low vibration mean it’s easy on occasional users. It makes for an excellent mid-range saw for maintaining property or light professional use. The Husqvarna 450 has everything a property owner needs with the quality to reach into entry-level Pro work. Milwaukee’s Gen 3 M18 Fuel Combo kit spec’s out about the same as the Gen 2 models, but with a huge difference. And by huge, I mean small. As in the tools are much more compact, giving you high-end performance in a competitively small and ergonomic package. The 2804 hammer drill features 1200 in.-lbs. of torque and 2,000 RPM and partners with the 2853 impact driver with 2,000 in.-lbs. of torque and 3600 RPM. Between the two, you’ll be drilling and fastening in style while other guys are falling behind. The kit comes with a pair of 5.0 Ah batteries that you’ll be hard-pressed to outwork and unlocks Milwaukee deep line of M18 and M18 Fuel tools. If the Pro on your list has been saintly this year, this is the combo kit they deserve. Husqvarna pairs their rear wheel drive system with a Honda GCV160 engine on this 21-inch walk behind mower. The drive system includes Husqvarna’s Auto-Walk feature that lets you adjust the speed to your comfort level. With the ability to bag, mulch, or discharge, you’ll be getting your small to medium size yard cut with much less effort than a standard push mower. Get this for the homeowner that’s ready to upgrade to self-propelled ease and the quality of a Honda engine. Festool takes their passion for German-engineered performance and incredible ergonomics to create the Stirrers MX 1200 mixer. It has all the features Pros demand: height adjustment since not all of us are 5’10”, a variable speed dial to cover a variety of mixes, and soft start to help keep the splatter down. The handles ergonomics keep all your controls in easy reach with a comfortable grip. It’s more than just a pretty package, though. The MX 1200 is tough and has plenty of torque for those thick mixes. Festool also has a complete line of paddles so you can match it up with the job at hand. This makes a great gift for drywallers, painters, flooring Pros, and masons. When you’re ready for high performance demo work without the cord, take a look at Bosch’s GSA18V-125 reciprocating saw. The brushless motor powers through metal, wood, and more with even better performance using a Core18V battery. The “hawkbill” design has excellent ergonomics and will be a major step forward for your next job’s productivity! Pick this one up for the Pro who’s skeptical that a cordless tool has the power to do effective demo work. If you’re ready to make the switch to a battery-powered chainsaw, check out what Milwaukee has to offer with their new M18 Fuel chainsaw. It comes packed with the new 12.0 High Output battery and rapid charger to give you power that outperforms a 40 CC gas model. There’s none of the emissions or noise and a whole lot less maintenance. This one makes a great gift for homeowners that need to do property maintenance and Pros that want a battery chainsaw to supplement their gas saws. If you’re looking for a smooth-cutting, accurate miter saw this year, Makita’s LS1019 is a solid pick in the 10″ class. The secret to their success is a direct drive motor instead of a belt driven system. This gives the saw a feeling of more confidence during the cut and eliminates the need to replace the belt as it loosens over time. Other features like a laser cut line indicator, front mounted bevel lock, and soft start check off all the right boxes. Plus the rail system doesn’t extend behind the saw, so you can set it up against the wall and not worry about losing capacity. 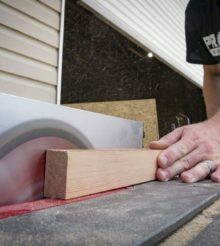 10″ miter saws make a good general purpose size for framers, carpenters, and everyone in between. When you’re ready to upgrade to 40+ Newton blowing force, Stihl has you covered with their new BR 800 backpack blower. This beast of a blower puts out 199 MPH and 912 CFM with its 79.9 cc engine. The C-E Magnum edition also a side start function that lets you pull start while you have it on your back. Better yet, it’s an easy pull instead of forcing you to throw out your shoulder or look like you’re doing a dance that you thought was left behind in high school. Since it’s a Stihl product, you’ll have the support of the service dealer network. This is a high-end backpack blower for commercial Pros.